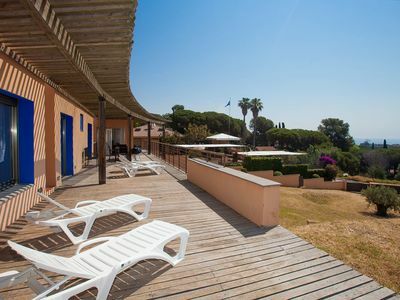 Large, simple, comfortable villa "Les Alzines". In a quiet position residential area (villas), 500 m from the sea. Private: lawn for sunbathing, beautiful garden to relax. Terrace (100 m2), garden furniture, barbecue. Possible. Airport transfer (extra). Parking at the house on the premises. Shop 400 m, supermarket 350 m, shopping centre 2.5 km, restaurant 300 m, railway station "caldetas" 2 km, sandy beach "caldetas" 500 m. Sports harbour 3 km, marina 3 km, golf course (18 hole) 18 km, surf school 3 km, sailing school 3 km, tennis 2 km, indoor tennis centre 2 km, riding stable 7 km, sports centre 2 km. Nearby attractions: barcelona 35 km, girona 70 km, Tossa mar 30 km. Please note: groups of teenagers on request only. On request: airport transfer to the holiday accommodation. Fishing [permit required], private mooring (extra) on request.